Resume Writing Service, Certified Professional Resume Writer & Career Specialists at The Write Resume! $20 off the preparation of your resume! Hurry - offer ends 11/30/2014 ! Price discounts are reflected on this page. Your resume is one of the most important documents you will ever create - especially in this tough economy. This marketing tool is what stands between you and an employer calling you for an interview. Some job seekers regard the resume as "just a piece of paper." Think about this - a $1 bill and a $1,000 bill are both "just paper," too. But, like a resume, their value is determined by what is printed on that piece of paper. Your value is determined by effectively communicating what you can bring to the next employer. A resume is a "marketing" document, designed to "sell" an employer on why they should contact you. If you "undersell" your skills and accomplishments, an employer will move on to the next resume. Hiring a Dual-Certified Professional Resume Writer and Credentialed Career Master will maximize the number of interviews you will gain and your job search success. Ensure employers will contact you by hiring a professional resume writer! You will work one-on-one with a Nationally Certified Resume Writer, Certified Professional Resume Writer, Credentialed Career Master, and former Fortune 500 Hiring Manager. Our approach is custom-tailored for each client. We only prepare the documents that you will need for your job search and we do not use templates. We have been in the resume writing business for more than 23 years. This is not a "hobby" for us. We spend a great deal of time educating ourselves about the trends in the employment market. 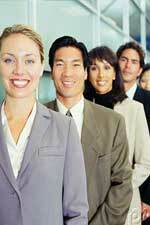 We partner with Human Resource Professionals and Recruiters through memberships in various organizations. This helps you, as our client, because we have a direct line to the people who will be hiring you! A thorough one-hour telephone consultation where we get to know you and your career goals. ***Normal turnaround time for resumes is 7-14 business days. If you require rush service, additional fees apply. IT experience in non-supervisory roles. Take the first step toward a better career. Contact us right away to discuss your specific needs at 1-866-726-9052!